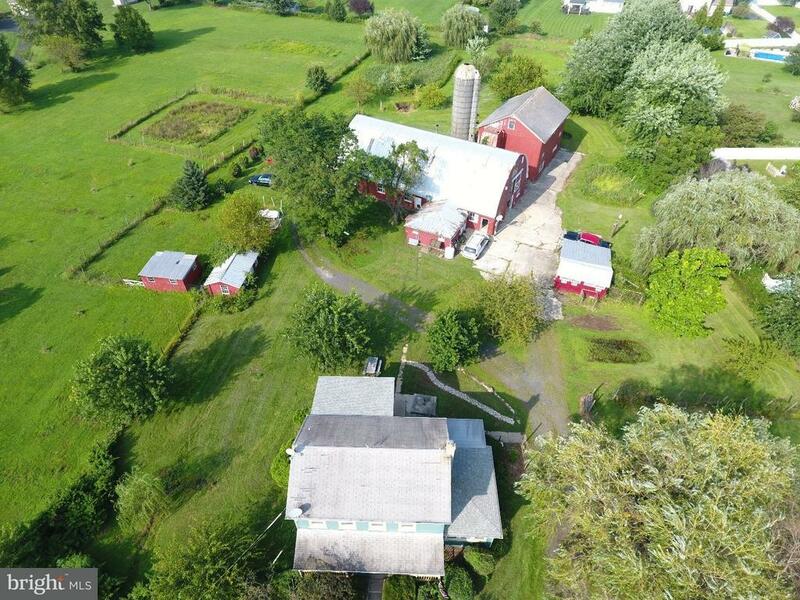 Welcome to a wonderfully unique opportunity to own a 4 bedroom, 2 bath circa 1880 farmhouse with all the charm of yesteryear but updated with the 21st century amenities located on 4.45 acres! You are greeted by a country slate front porch. Come inside the quaint stained glass front door into the cozy family room with a warm brick hearth fireplace, custom wood shelving and hardwood floors. To the left is a den/study just full of old charm with loads of room for all your books on the built in wooden shelves, enjoy the lovely coffered ceiling, beautiful wood hearth mock fireplace, hardwood floors and ceiling fan to keep you cool as you relax.To the right is a beautiful bright year round sun room (or 4th bedroom), windows galore, with white wooden shutters and hardwood flooring! For your convenience a full bathroom is located off to the side. Next you stroll into a spacious true eat in farmhouse kitchen with maple cabinets, tiled counter tops and back splash, lots of nooks and crannies to place all your cooking utensils, stained glass windows, ceiling fan and hardwood floors as well. Just a few steps and you are in the oversized mud room perfect to remove your outdoor clothing/shoes before coming in. Upstairs are 3 bedrooms all are of generous size with lovely 8 inch base boards, detailed millwork around framing of doors and hardwood floors. There is an additional room large enough to use as storage or as a dressing room. Another full bath is also located upstairs equipped with a newer Jacuzzi tub, bead board walls and stained glass windows. The farm includes two large barns. The first contains two separate living quarters with some upgrading has great potential to be used as in law suites and there is a heated shop area on first floor. The second has two floors of storage space. There are two sheds, a chicken coop and three ponds! This property is just filled with character and truly a wonder to see! Property Being sold "AS IS".